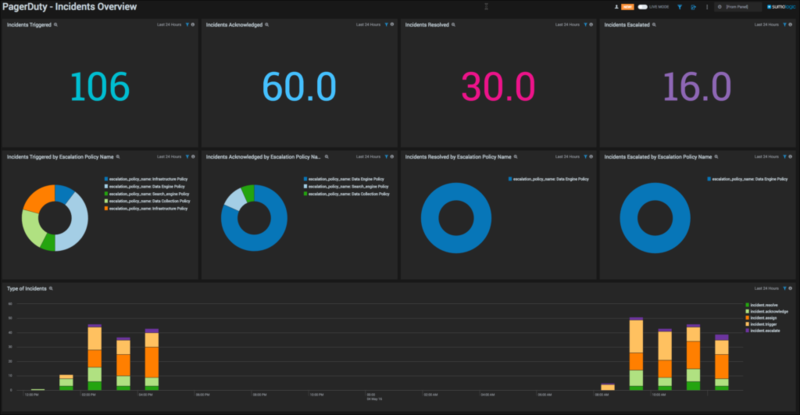 Use preconfigured dashboards to easily monitor and analyze incident data. Create webhook connections to send alerts based on scheduled searches. 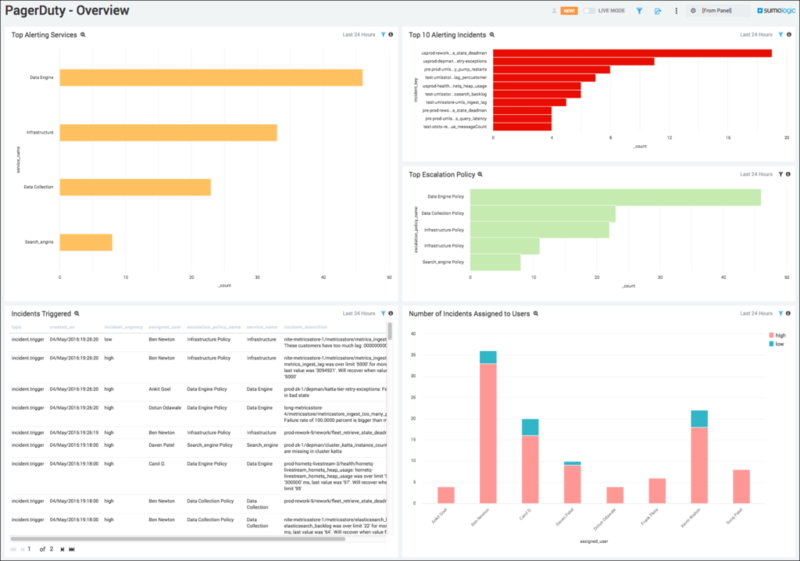 Overview: Top alerting services, top 10 alerting incidents, top escalation policy, incidents triggered in past 24 hours, number of incidents assigned to a user. Incidents Overview: Reporting on incidents triggered, acknowledged, and resolved, as well as incident types. Incidents by Urgency and Escalation Policy: Reports covering daily and weekly incidents according to high or low urgency and the respective escalation policy. PagerDuty works with Sumo Logic using Webhook connections. These connections allow users to send Sumo Logic alerts to third-party applications that accept incoming Webhooks. For example, once you set up a Webhook connection in Sumo Logic and create a scheduled search, you can send an alert from that scheduled search through your PagerDuty account. In addition to an alert, you can include a link directly to a search and even a few search results (depending on the third-party tool you're connecting to). There is no limit to the number of results sent via Webhook on the Sumo Logic side, but restrictions may exist for your other third-party tools. After setting up a Webhook connection in Sumo Logic and creating a scheduled search, users can send alerts from that scheduled search as a PagerDuty notification. This helps alleviate the “alert fatigue” that plagues many modern IT departments by prioritizing alerts and allowing for new types of targeted messages. |PagerDuty works with Sumo Logic using Webhook connections. These connections allow users to send Sumo Logic alerts to third-party applications that accept incoming Webhooks. For example, once you set up a Webhook connection in Sumo Logic and create a scheduled search, you can send an alert from that scheduled search through your PagerDuty account. In addition to an alert, you can include a link directly to a search and even a few search results (depending on the third-party tool you're connecting to). There is no limit to the number of results sent via Webhook on the Sumo Logic side, but restrictions may exist for your other third-party tools. After setting up a Webhook connection in Sumo Logic and creating a scheduled search, users can send alerts from that scheduled search as a PagerDuty notification. This helps alleviate the “alert fatigue” that plagues many modern IT departments by prioritizing alerts and allowing for new types of targeted messages.|View the webinar to learn more about scheduled searches and how Sumo Logic integration with PagerDuty helps you monitor and resolve business-critical events.